The internet's largest bodyboard shop! We carry bodyboards, bodyboard dvd's, BZ Bodyboards, Morey Bodyboards, boogie boards, bodyboard bags, swimfins, Mike Stewart Bodyboards body boarding gear, and bodyboard accessories. 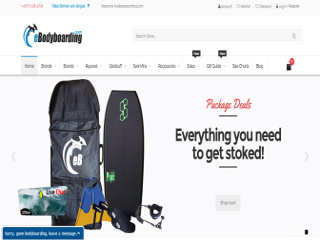 Visit the website of eBodyboarding | The largest bodyboard shop in the world now ! eBodyboarding | The largest bodyboard shop in the world , belonging to category "Bodyboard Shop"